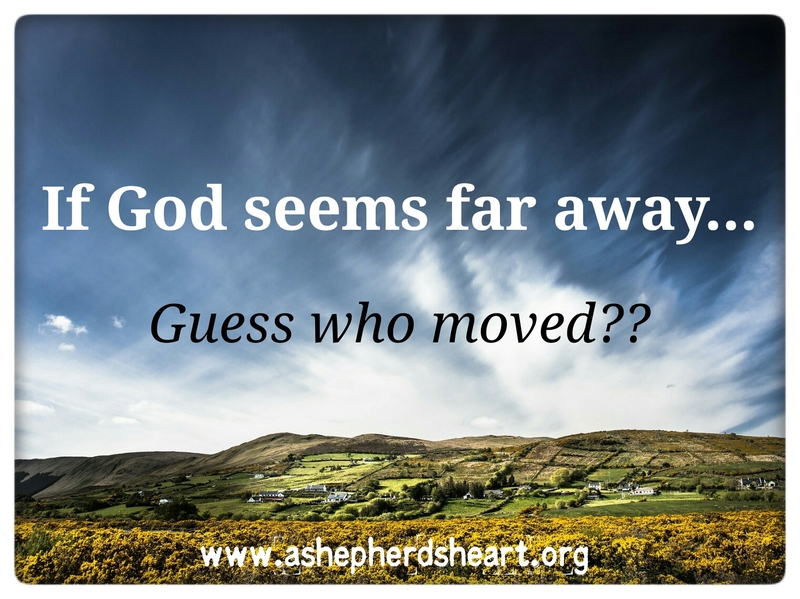 A Shepherd's Heart: 5 Practical Things You Need To Do When God Seems Distant! 5 Practical Things You Need To Do When God Seems Distant! Read: Deuteronomy 31:6, Hebrews 13:5, 1 Peter 5:8, Ephesians 4:25, Ephesians 6:18, 1 Thessalonians 5:17, Hebrews 4:12, 2 Timothy 3:16-17, James 1:22, James 4:7, John 15:4, Hebrews 4:16. I often hear people say that "God is distant" or that "God seems far away" and let me tell you: this is the furthest thing from the truth that anyone can proclaim, think or feel! In other words, this is flawed thinking or what I refer to as "stinking thinking". Why do I say this? "Spoiler Alert"...in case you forgot...It's because in God's Word, He tells us that He will never leave or forsake us and we can take Him at His Word! Just as the enemy helped confuse Adam and Eve, which contributed to them doubting God and not taking God at His Word as well as led to their sin against Him...he tries to do the same thing in our lives so that we also might doubt God and take Him at His Word. When we feel or think that God is distant, I guarantee you that if you are in Christ, it's NOT God that has moved...you and I are the ones that for one reason or another have distanced ourselves from God and His Word. So what should you do when you start to think or feel this way? Recognize: Recognize that those thoughts and feelings are from the enemy of your soul as he is the author of confusion and lies where as with God, the truth is that God says in His Word...He will never leave or forsake you. Reject: You need reject those thoughts or feelings. Pray: You need to pray - talk to God and ask for The Holy Spirit to help you listen to God's truth only and not the lies. Read and Abide: You need to dive into and study God's Word which ultimately will divide the truth from the lies! Abide in His Word. Stop Moving Away From God and Do approach Him with Confidence: You need to stop moving away from your relationship with God...and start approaching Him with confidence when you start to feel "He's distant". If you never spend time with God through His Word and through prayer, you won't hear Him or understand His reassurance that He indeed is near. Furthermore, if you never spend time with Him, it's no wonder that you feel He's distant from you. Again, let me encourage you that God is not distant from you friend as He will never leave or forsake you! You may have tried to distance yourself from Him but rest assured that He's never distances Himself from you. It's time to return to Him as He's always ready and waiting with arms wide open to receive you and help you grow to become firmly rooted and established in Him! If you've moved away from Him, it's time to move back toward Him and seek Him with all that is within you. P.S. Please encourage others who struggle with this too by helping point them back to the Word of God...the true and final authority on these matters! Pass it on!